When Tampa Bay is running: The decision to use Earnest Graham as the third down back is going to be one that smallish, faster defenses are going to hate. The Buccaneers are unleashing a punishing rushing attack, and they don’t care who knows it. Last year, Blount had 110 yards rushing and a 7.33 per-carry average with 1 TD against this defense, but Raheem mentioned going conservative in the post-game. The Bucs’ line is healthier this year, the passing attack is going to be more potent, and this just opens things up for the run. That said, Detroit is one of those young teams playing with a nasty attitude and – unlike their offense – has enough continuity to really play with abandon. They gave up 4.5 yards-per-carry last year and 18 TDs. They will undoubtedly be better this year. Edge: even. When Tampa Bay is throwing: The Lions secondary was something they wanted to address this offseason. Other than the awkward pay-cut scenarios in the Big Apple, Johnathan Joseph rebuffing the Lions was actually a bigger deal than Nnamdi Asomugha rebuffing the Jets. At least the Jets still have Antonio Cromartie and Darrelle Revis. The Lions picked up Eric Wright, who’s a little above average. He’ll start, as will Chris Houston. FS Louis Delmas is pretty good, Amari Spievey can be attacked. For the Bucs, WR Arrelious Benn is coming off ACL surgery. It will be fun to see if Suh – who predicted 16-0 for his team will be able to bring down Josh Freeman. Edge: Tampa. When Detroit is running: The Bucs were notoriously horrible at run defense last year, but they were also quite injured. 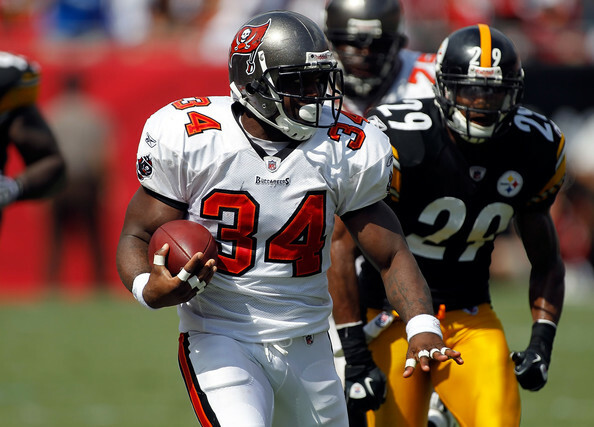 The Bucs play hard for Raheem Morris and that youthful energy and the 2011 acquisitions – Mason Foster and Adrian Clayborn – are the main factors with which I pick them to stop Jahvid Best, Jerome Harrison and Maurice Morris. Those three – with Harrison as a Brown and an Eagle – combined for just two 100 yard games last season while one of them was Maurice Morris against this team. A lesser factor is that in the big 3rd preseason game, they held the Dolphins to 22 yards on 17 carries, 1.3 yards-per-carry. Edge: Tampa. When Detroit is throwing: By week 4, I expect the Lions receiving corps to be 2nd best – not statistically, just in overall performance and talent – to only the Cowboys. For week 1, a fired-up, physical secondary will cause issues for Calvin Johnson and Nate Burleson. What will push the Lions into another stratosphere will be when the new receivers get the offense down. Sunday is the first game in the offense for Titus Young, Maurice Stovall, and Rashied Davis. Young’s barely even practiced in it. Edge: Detroit, slightly. PREDICTION: The Bucs are blacked out again. The Saints are the talk in the media. Top Bucs players narrowly avoided suspension, or are coming back from one. The Falcons were the team that went all out by bringing in Julio Jones and Ray Edwards. The Bucs will bring that youngry heat and find a way to get enough sacks and long pass plays. In the end, the Lions secondary is not yet ready for a battle of this magnitude. Bucs 31, Lions 30.